Do you want a compact and stylish speaker set that produces powerful sound? Than the WEIYATS 2.0 is what you are looking for. The WEIYATS 2.0 is ideal for listening to music, watching movies or playing games. With a peak power , the speaker provides a rich and powerful sound. Maximise your listening experience with the WEIYATS2.0! The small cat design is unique and attractive. It will be a perfect gift for your families and friends. Easily control the volume and the bass level, by using the controls attached with the speaker. On top of that, the speaker contains an extra input connection for your iPod, iPhone or MP3 player. With the WEIYATS 2.0 you can enjoy your own music, as well as the music of your friends and family. Easy to reach volume and bass control at the front. Line-in connection for tablet, phone or mp3 player. 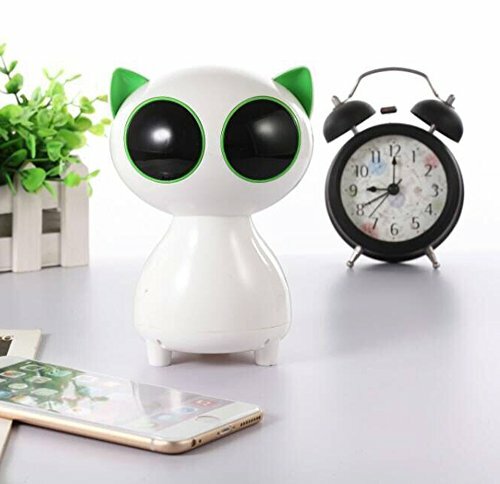 USB powered: no wall power needed.The eyes flash with the sound and there is a volume control on the cord. Unique design and easy to storage. Perfect gift- A perfect holiday gift for your beloved ones. If you have any questions about this product by WEIYATS, contact us by completing and submitting the form below. If you are looking for a specif part number, please include it with your message.